Our latest strategy and analysis on AAPL stock. There is no lack of news on Apple Inc. (AAPL) . Even though I try to stay on the straight and narrow path of charts and indicators one cannot block out the news of buying by Warren Buffett or the launch of new products. Our own Jim Cramer discussed some of the latest company developments Thursday night on Mad Money. I last looked in on AAPL the stock in the middle of August, writing that one should "stay long AAPL and raise sell stop protection to $195....we can see (on the Point and Figure chart) a bullish price objective of $255." Prices have advanced to new highs in the past month so let's take some time this morning to check over the charts once again. In the daily bar chart of Action Alerts PLUS holding AAPL, below, we can see how prices accelerated higher from early August. AAPL is above the rising 50-day moving average line and perhaps too far above or extended versus the bullish 200-day line. The daily On-Balance-Volume (OBV) line turned up in April and was very strong in August signaling more aggressive buying. The 12-day price momentum study in the lower panel shows lower highs from August to September telling us that the rate of price gains has slowed. This bearish divergence is not likely to generate a top reversal. In the weekly bar chart of AAPL, below, we can see that prices have more than doubled from the $90 area back in early 2016. Prices are above the rising 40-week moving average line and perhaps a bit extended versus that slow to react indicator. The weekly OBV line is bullish and so is the weekly Moving Average Convergence Divergence (MACD) oscillator. In this updated Point and Figure chart of AAPL, below, we can see our $255 price target again. Bottom-line strategy: The fundamental analysts will continue to make estimates of sales, etc. but for now the charts and indicators are bullish. Prices are extended when compared to the longer moving averages but that may only mean that AAPL trades sideways for a few weeks. Traders should consider raising stop protection to $205. 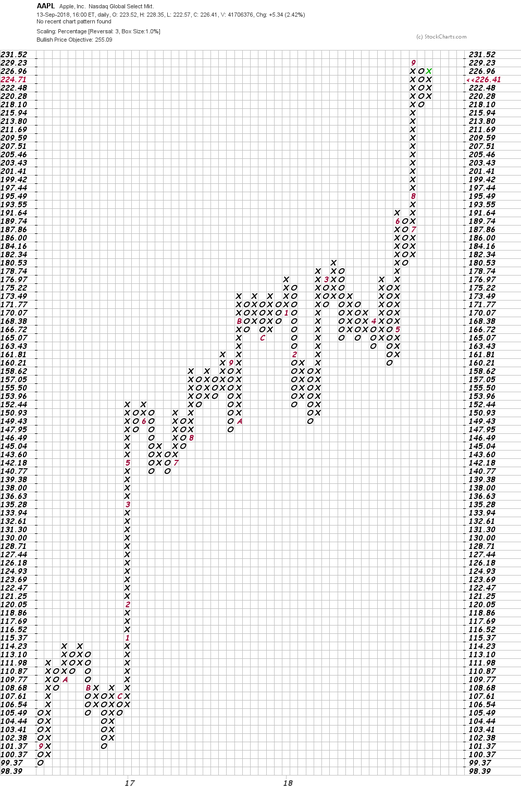 Our Point and Figure price target is $255 and $270 would be a triple from the $90 base back in 2016. Action Alerts PLUS, which Cramer manages as a charitable trust, is long AAPL.